The wheatbelt region in Western Australia is the source of nearly two thirds of the state&apos;s wheat production, half of its wool production, and a range of other agricultural and pastoral products. With considerable effort made to support the efficient transport of goods in the region, the existing road maintenance regime for one local shire was becoming unrealistic in both cost and resource management. Therefore, in a recent road widening and reconstruction project, the Shire made the decision to strengthen the base course with PolyCom Stabilising Aid. 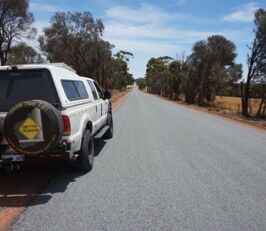 Three years on, the Shire has used PolyCom on approximately 15 kilometres of road per year to reduce degradation and road failure, and overall wear on the sealed surface. • Reduced flushing of bitumen at the surface. Maintenance on the PolyCom treated sections of road have been reduced, making for a sustainable solution where resources can be utilised to do other works required. Traditional road construction methods suggest there is an upper limit to CBR readings that will result in cracking. However, by maintaining flexibility of the treated pavement and raising overall pavement strength, PolyCom has allowed maintenance crews to achieve much higher CBR values using the material already present in these roads without failure. This factor allows use of lower grade materials that will generate a superior outcome. The use of PolyCom has saved considerable resources for the Shire, and lead to fewer complaints from the public.